Researchers at Lund University in Sweden have developed small, portable solar cell water purification plants. With the help of Nobel Peace Prize recipient Muhammad Yunus the purification plant stations, called Micro Production Centres (MPC), have now been placed across rural Bangladesh. "750 million people lack access to clean water across the globe. Providing safe drinking water is one of the biggest challenges and one of the most important goals for humanity," says water purification plants’ inventor Kenneth M. Persson, Professor of Water Resources Engineering at Lund University. The environmental company Watersprint, founded in 2013 by Kenneth M. Persson and engineer Ola Hansson, has patented the technology that helps purify water by combining UV-LED technology with intelligent software and Wi-Fi. Yunus and his organization Yunus Centre have ordered portable units as part of a pilot project. In October, the first unit was installed and by now, another 9 units have been delivered to the project in Bangladesh. The MPC portable purification units are managed by local suppliers and help create jobs for young, unemployed people who run the small facilities and sell clean water in exchange for a small fee. A large part of the population in Bangladesh currently use water contaminated by arsenic. 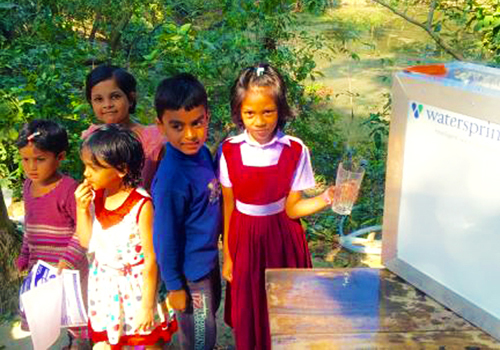 "Thanks to these portable units, communities can now purchase inexpensive, clean water, and at the same time, in accordance with Muhammad Yunus's model, a lot of them can make a small profit by running the plants themselves," says Persson. Watersprint recently signed a contract with the United Nations for placing 500 portable units in Bangladesh. The units can be connected to Wi-Fi and they include software that monitors the machine. Alerts in case of malfunction will be directly seen through the LED lights on the machine and through alerts sent out via text message to any mobile phone that is connected to it. "The installations are hopefully only the first step to set up similar structures in several other countries that lack access to clean water," says Persson. *Professor Muhammad Yunus received the Noble Peace Prize in 2006 for founding the Grameen Bank and for his work on micro-loans. He also coined the term "social business," which provides access to technologies and services for solving social or societal problems. The above article is reprinted from materials provided by Lund University: Lund University. "Solar cells help purify water in developing countries." ScienceDaily, 15 February 2016. Available at http://www.sciencedaily.com/releases/2016/02/160215090541.htm and http://www.lunduniversity.lu.se/article/watch-solar-cells-help-purify-water-in-remote-areas. Published on the Horizon International Solutions Site on 8 April 2016.